When looking through Google Newspapers the other day I noticed as I scrolled through the pages of the Youngstown Vindicator that there were several front pages, each different from the previous one. Looking closely at the dates, I noticed a few things and I remembered that a few generations ago many of the larger cities' newspapers printed more than one edition during a day. As details about news developed, the newspaper changed, added, or omitted content from one edition to the other. This is the front page of the Monday, May 20, 1918, noon edition of the Youngstown Vindicator. And this is the front page of a later edition of the same newspaper on the same day. Some of the front page headlines have changed. Be sure you check multiple editions of the newspaper if they're available. Content may change from one edition to the other. Newest news may be sparse in the early edition, more detailed in the later edition. Some articles may be omitted from the later edition, or new articles may appear if there's space. This could include articles about your ancestor. Even if Google News tells you that there are no editions of a newspaper, be sure to check previous and subsequent dates. 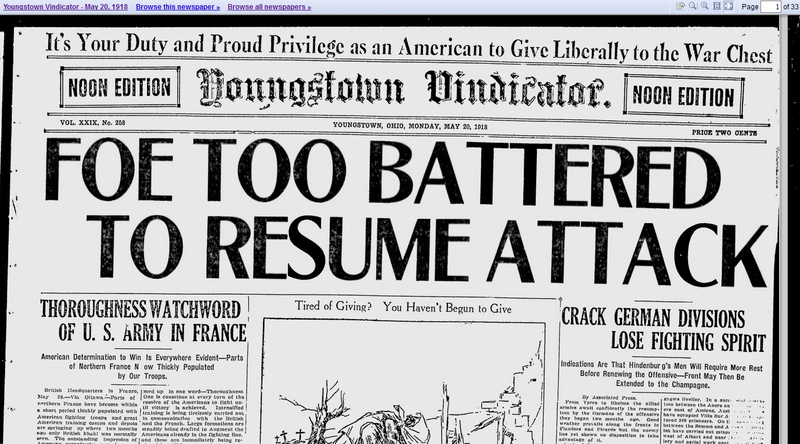 Google News showed no copies of the Youngstown Vindicator for May 21, 1918. 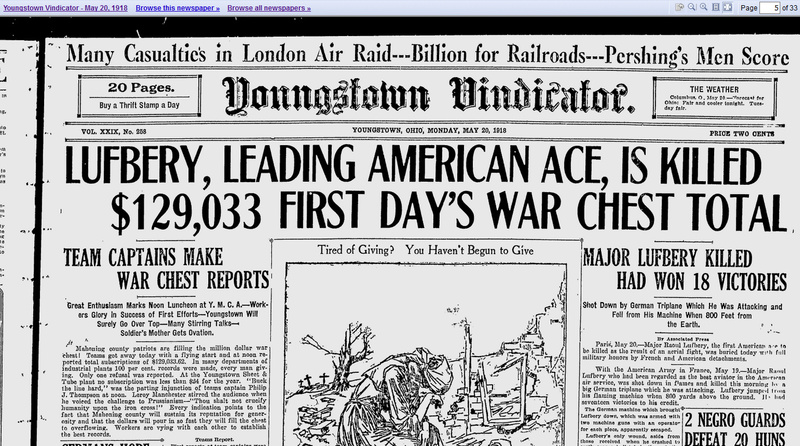 But when I scrolled through all pages for May 20, 1918, I found the May 21, 1918, newspaper near the end. What is your best search hint for online newspapers? Copyright ©2018, Nancy Messier. All Rights Reserved. Do not copy or use any content from this blog without written permission of the owner. Good tips, Nancy, thanks! If memory serves, the morning and afternoon editions of the newspaper I subscribed to years ago had different names. The morning edition was the Virginian Pilot; the afternoon edition was the Ledgar-Star. Thanks, Liz. I know some newspaper publishers published several different newspapers with different names but it's possible that in your city, they were the same newspaper but with different names. Thanks for the interesting points, Nancy! I had forgotten that papers often published more than one edition. Now that I think about it, I always liked reading the evening edition of the San Jose News when I was growing up, because the stories seemed more robust. You're welcome, Linda. I suppose the evening editions would have had more detailed news, especially for some articles. I wonder how news was relayed decades ago, before the immediacy of the internet. It's possible that the international news arrived during the night and early morning, with more as the day progressed so the evening newspapers would have had more content. Thank you for this tip. For me old newspapers are fascinating documents on life In a moment in time. I use the Newspaper archive on www.findmypast.co.uk - great for both local and family history. You're welcome, Sue. I'm with you. I love looking at and reading old newspapers and imagining my ancestors living during that time with the local and world events that were happening around them. I haven't used Find My Past for a while. I find it difficult to use, especially if I want to browse a record set instead of search it. There's probably a way to browse but I haven't found it. I should use the website more, since I've been researching ancestors in England. Great tip Nancy. I too forgot there were two editions. Living in the country we only got the morning one delivered, but I know there was an evening edition. I often browse at FMP newspapers because names aren’t always clear for searching. Another thing I do is search on British Newspaper Archives (without subscription) and when I get a promising hit I look for the same newspaper issue at FMP. Thank you, Dianne. Now that two of you have mentioned Find My Past newspapers I'll have to explore their selection more and see if I can find some helpful articles. And that's a great tip to search British Newspaper Archives and look at FMP. I'll try that. Thanks again.